If you are looking for a new way to advertise, consider using our promotional tokens. 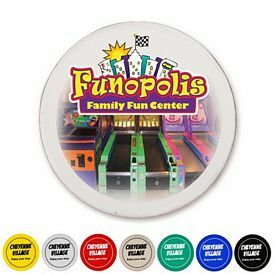 Imprinted tokens are inexpensive and creative products to help you promote your business. 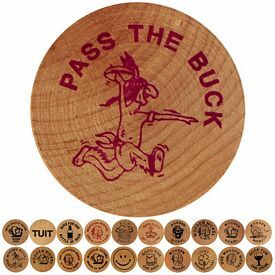 These customized tokens come with a 1-color logo imprint on both sides. You should print your business’s name or logo on one side, and on the other side you should print a slogan or a special discount for your products. For example, you could print things like, “good for 1 soft drink” or “good for 1 cup of coffee.” We have a variety of template designs that you can choose to customize your trade show tokens with. Whether you choose to use our own designs or some of your own, make sure you design these logo tokens in a unique way, so that your customers will remember you. All sorts of business can advertise with our promotional tokens. One of the best places to advertise with these custom tokens is at trade shows. These may seem like very basic promotional products, but these imprinted tokens can have a big impact on your business. By handing these personalized tokens out at trade shows, you’ll leave your customers with a small reminder of your company. Hopefully, this will help lead your customers to contact you the next time they need your services. As mentioned earlier, we have various stock designs that you can choose to print onto your custom tokens. One design that you should consider imprinting on these trade show tokens is the TUIT design. This phrase reminds people to “get around tuit.” It’s the same concept as tying a ribbon on your finger to help you remember to do something. Imprinting these promotional tokens with “TUIT’ or “ROUND TUIT” will just give your customers a simple reminder to get things done. For example, if you are advertising financial services, you can provide your customers with these TUIT tokens to remind them to invest with your company. Look through our website to learn more about our promotional tokens. If your have question about any of our products, give us a call. Our customer service team will be glad to help you. Don’t forget that we never charge setup fees on our products, which means that your promotional investment will become even more affordable. We will also do our best to make sure that these trade show tokens arrive in time for your next promotional events. What are you waiting for? Order these imprinted tokens today!